Hyundai has given us a glimpse into the design philosophy of the upcoming Venue compact SUV with the release of its official design sketches. 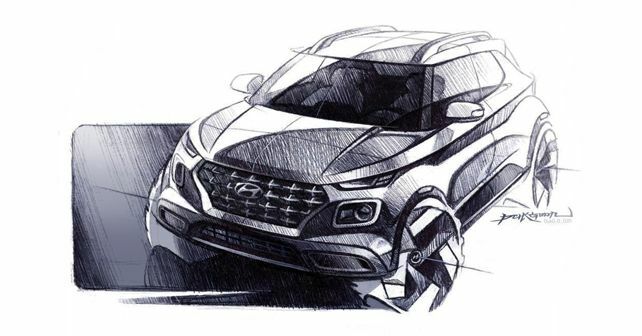 Building up to its India launch in May 2019, Hyundai has today revealed the official design sketches of its upcoming compact SUV, the Venue. While the car (donning camouflage) has already been teased by the Korean carmaker in its video teaser campaign, we have a fair idea about the overall shape and silhouette of the car. Now though, these design sketches give us greater insights into the finer styling details. Well, first impressions: The design is certainly quirky and youngsters will find this sort of styling very appealing. However, some elements, like the headlight design, lack originality as we've seen this layout on the Tata Harrier. Like the Harrier, the Venue gets its DRLs on the top while the main headlight cluster is integrated into the bumper. Further, the front grille carries over a similar shape like that of the Creta, but, instead of horizontal slats, the Venue is likely to feature a mesh design. At the rear too things seem to be a bit familiar. The overall rear profile (tailgate design and taillight layout) resembles a fair bit to the first-gen Grand i10. It comes across as the hatchback's crossover version. Also, we need to keep in mind that the lines and sweeps on the actual, production-spec model are likely to differ a fair bit as the sketches are of a two-door concept vehicle, whereas the production car will be a four-door version. The interior sketch also reveals an important design change: The Venue will most likely feature a floating touchscreen instead of the integrated screen, like that on the Creta. The overall interior design approach seems to aim for an uncluttered & modern look. While details about the car's mechanical specs are still pending confirmation, what we do know is that the Venue will be the first Hyundai in India to feature the brand's 'Blue Link' connectivity suite, meaning that it will go on to become the first 'connected' car in its segment. Apart from that, Hyundai India will hold an exclusive preview of the Venue in India on 17th April 2019, alongside its global premiere at the 2019 New York Motor Show.